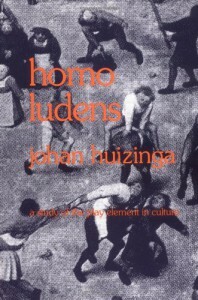 Homo Ludens: A Study of the Play-Element in Culture - Ana V.
first and foremost, this can't be a review with a plot resume or a linear story line. it's an essay, a study, a scientific paper (a long one, for sure) and it brings along a baggage of information that you can hardly incorporate. i have only been seriously reading scientific, non-fiction works for about a year, and i only lately decided to step up the game and try approaching the more complex books of the genre. my reason? my culture level didn't permit me to understand such works until then. i had information, but it was scattered and frankly, useless, because it wasn't ordered or in a specific scheme. it just sat there in my brain and floated along, pieces and pieces of everything that i ever learned or randomly memorized. so, when i started reading this one right here, i immediately felt at a loss. it truly was a book i took my time on, 10 pages at a time, just trying to assimilate the ideas and order them around, make them fit somehow. i'm pretty sure some of it didn't make it and i lost ir, but that's no big deal, there's always time for another read. and i fully intend to read it again, because there's so many more things to try and understand. this work is basically an introduction into how play is an undeniable part of human behaviour/mind/culture and how everything we do has a connection, on some basic level, with a ludic reality. i found most of the information plausible and took pains to research some more while reading, just to check and re check all of it. long story short, it's been a journey, but i made it and i hope i'll make it again.